One of my favorite things around the holidays, be it Easter, Halloween, Thanksgiving or Christmas, is decorating and coming up with new and fun crafts. This Halloween has been no different. I’m making vases with eyeball flowers. I’m making the Dead and Breakfast sign. I’m making the Halloween Countdown. And I’m making mini gravestones and mini coffins. Perhaps a little on the macabre side of Halloween but definitely fun! What I love about this particular project is how super simple it is. Its something you can do with kids or on your own. There pretty much is not a wrong way to put these together. And its something you can do in between other activities of the day. Oh and did I mention super inexpensive! Hey, and in my probably not so humble opinion, I think they look awesome on my dinning room table. Okay, maybe I’m biased. 1. 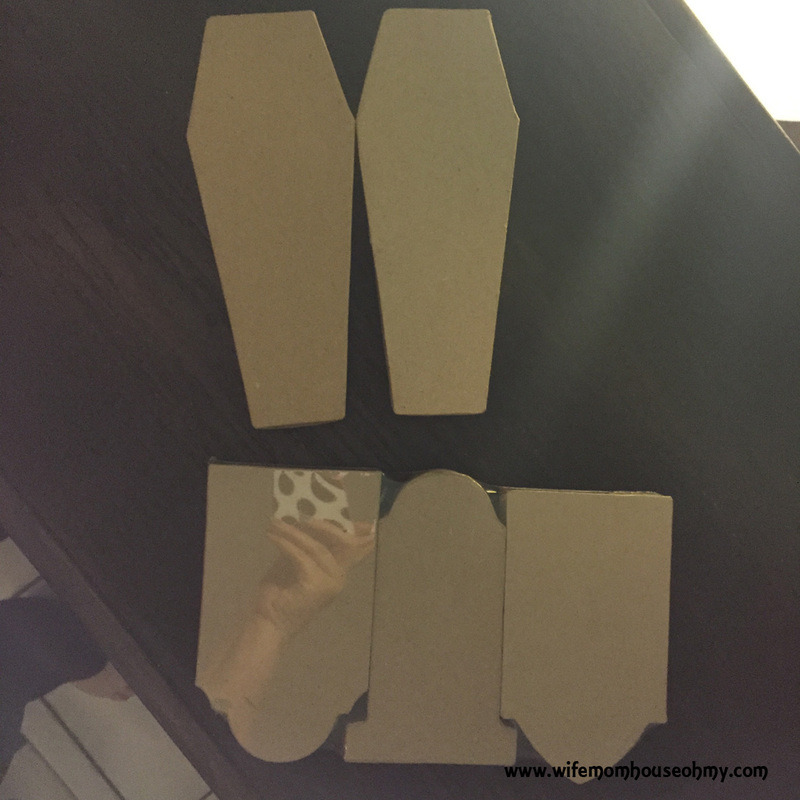 Paint the outside and the inside of the bottom and tops of the coffins using acrylic paint in black. Allow to dry completely. 2. Paint a small line around the perimeter of the sides of the bottom in gold. Paint a similar gold line around the perimeter of the top of the coffin lid. In gold acrylic, add a design such as a cross or skull and bones on the top. Allow to dry. 3. 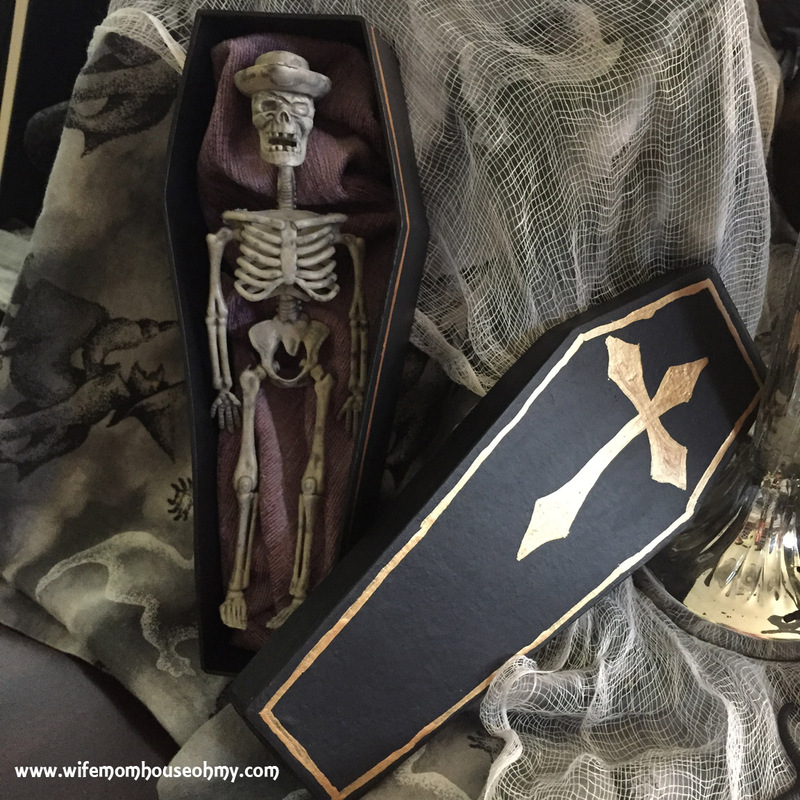 Cut a piece of scrap velvet or luxurious fabric large enough to bunch in the inside of the coffin bottom. 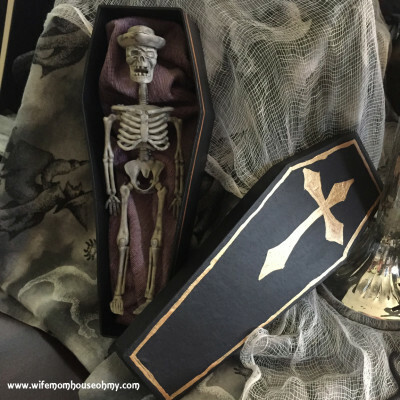 Bunch it inside the coffin and add a fun character such as a skeleton or vampire. Note: I got these super real looking mini skeletons from the 99 Cent Store. Three for a dollar – a cowboy, a soldier and morbidly a Santa. Told you it was super simple and super easy. 1. Paint the front, back and sides of each gravestones in medium or light gray color acrylic paint. Allow to dry. 2. 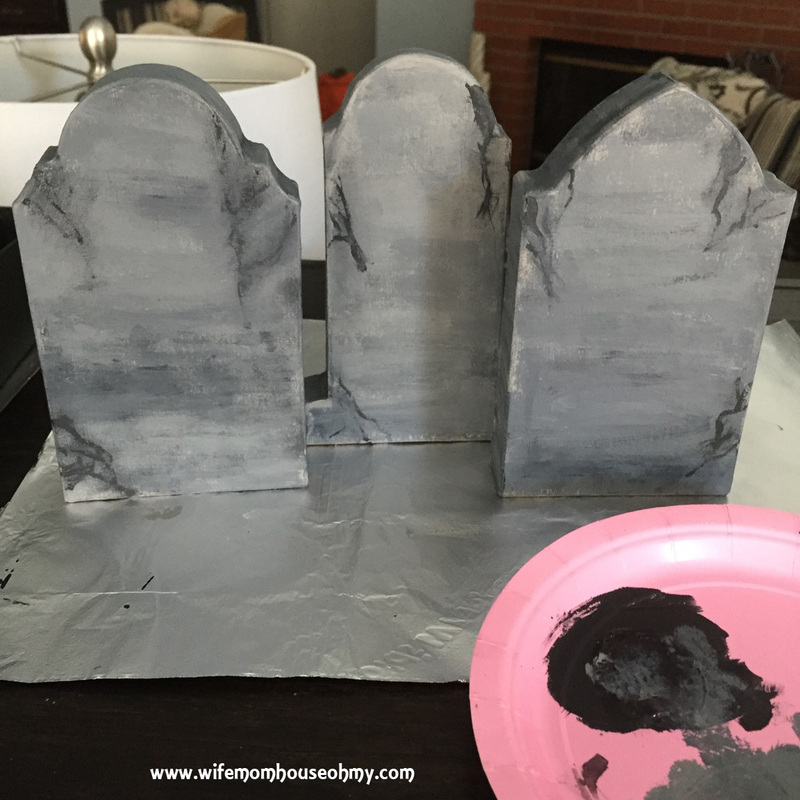 Mix gray and black paint on paper plate palette to get two additional shades of gray. Using a small flathead paint brush, stipple the brush into the dark gray paint. Brush the dark gray paint on the gravestone on to the bottom of the gravestone. 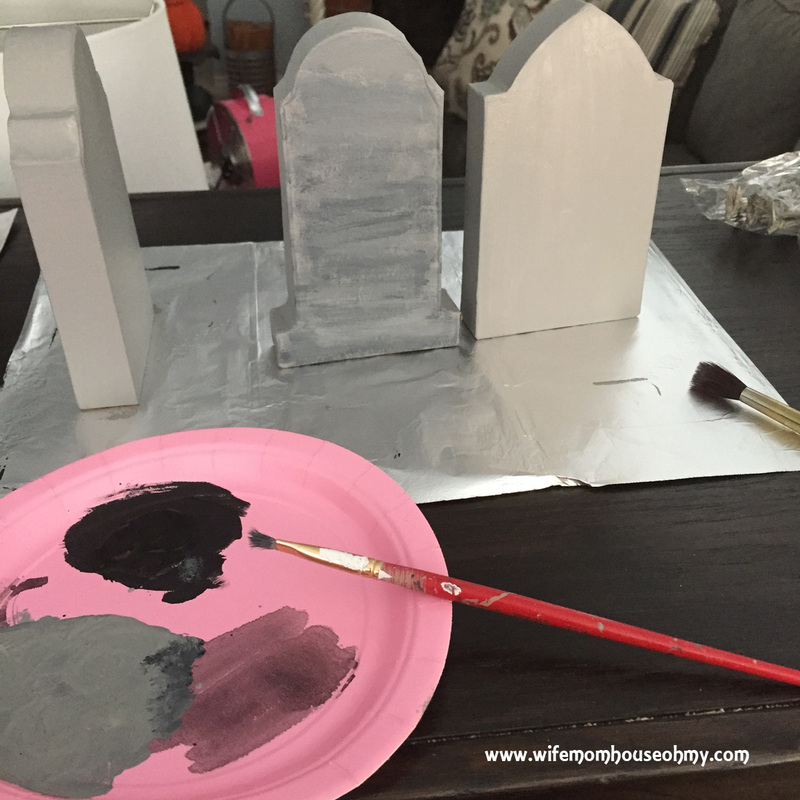 Stipple the same brush into the medium gray paint and paint the middle of the gravestone. 3. While the paint is still wet, take the last brush and dry brush over the paint to blend the colors together. Note: This makes the stones look distressed and aged. 4. Using the fine point brush and the black paint, paint on squiggles from the edges of the gravestone that will ultimately look like cracks. After each “crack” dry brush over it to smooth out the edges and make the cracks look real and deep. Note: If they are too dark, you can go over them lightly with the dark and medium gray paints until blended to the eye’s appeal. Allow to fully dry. 5. Using the fine point brush and the black paint, add the names and dates to the gravestones. Using your dry brush, slightly dry brush the lettering to distress them and make them look aged. Note: I also looked up some funny and real gravestones and used them. 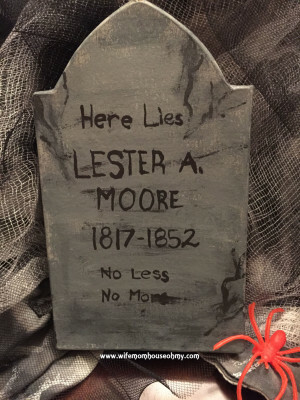 My favorite, though the dates are altered, is Lester Moore – a gravestone from Tombstone’s Boot Hill. I thought this was hilarious from my visit there years ago. As you can see, it stuck. Again, really simple. Really easy. And really cute! Okay, maybe macabre and cute. Either way, I just love them. Until next post! Can’t wait to see what I’m up to next!